Modern diesel engines rely on turbochargers to maximize performance and minimize environmental impact. While major internal engine breakdowns do happen, it’s far more likely you will face the failure of one of your peripherals, like a water pump or fuel pumps, and this includes turbochargers. In fact, turbos are especially prone to trouble, and the prudent cruiser should know where to look for signs of impending problems and how to minimize the risk of failure. Let’s begin by looking into the operation and composition of your turbo. A diesel engine compresses fuel and oxygen with enough pressure to create a controlled explosion. 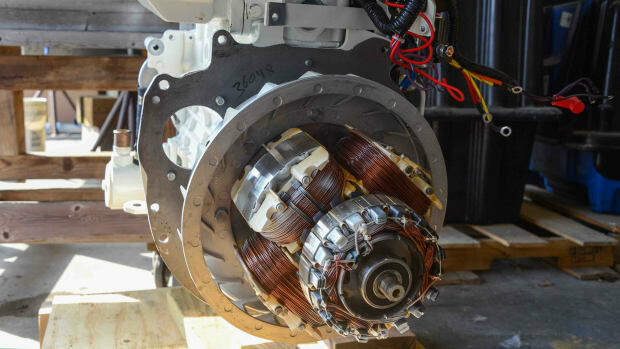 The more energy produced in this reaction, the more power that can be delivered to your propeller. The volume of fuel and oxygen is limited by the size of each cylinder, so that means if you want more energy, you must squeeze more BTUs into each measure of fuel or more oxygen into each measure of air. Up close and personal view of a turbocharger’s compressor wheel. As fuel heats up, it expands. This expansion means a loss of energy. To see how this works, imagine that on a cool morning you see a container of diesel fuel with the level exactly at the one-gallon mark. If you purchase one gallon of fuel that morning, you will have acquired 130,500 BTU of energy. If you wait until later that afternoon after the container has been sitting in the sun, the fuel will have expanded and the level will now be above the one-gallon mark. If you buy exactly one gallon during the hottest part of the day, you will leave some BTUs in the container. Exhaust gas (red) enters the chamber and spins the turbine on the right before exiting into the exhaust system. At the other end of the axle a compressor wheel then turns, forcing air into the engine at the top-left (blue). The blue on the exhaust side (right) shows coolant circulation from the engine. 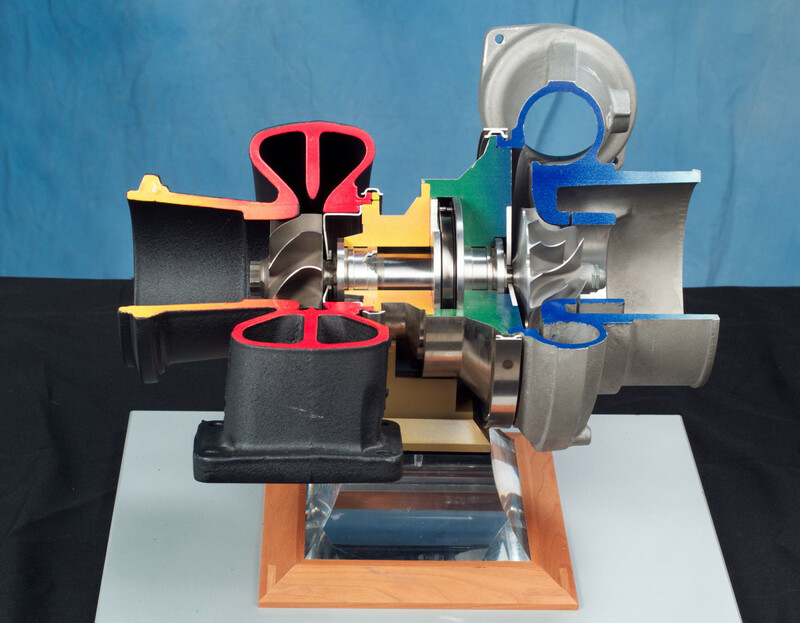 The cast housing of your turbocharger contains the following main components: a turbine wheel, a compressor wheel, and an axle to connect the two wheels. Oil from the engine lubricates these parts, and coolant from the engine helps remove heat from the housing. 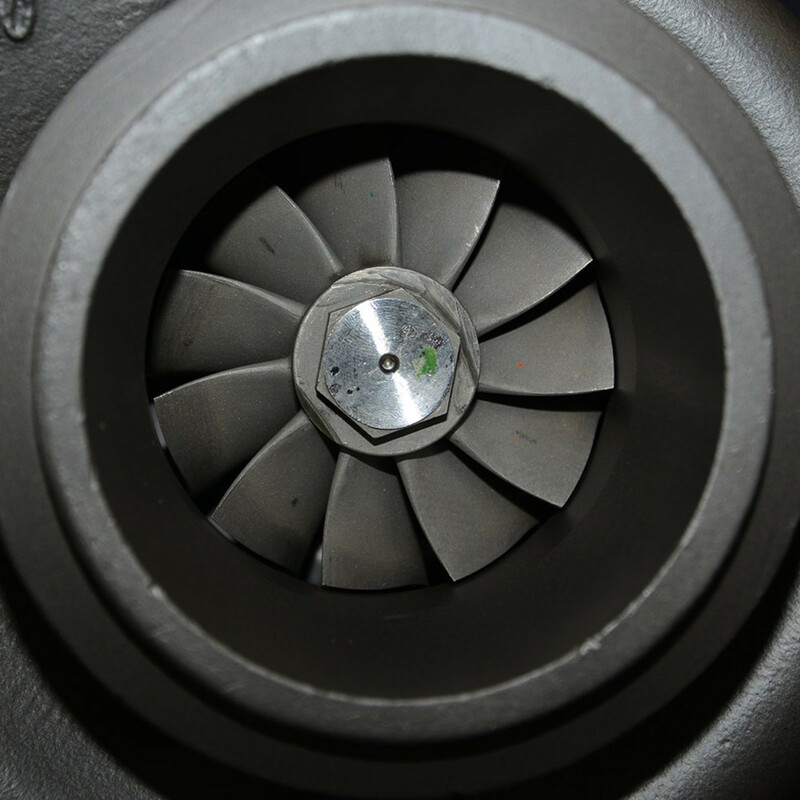 The turbocharger works much like a fan: Spinning blades accelerate the airflow. Driven by the engine’s exhaust gas, the turbine on one end of the axle spins at a remarkably high rate (as high as 100,000 rpm is not uncommon). This high-speed rotation also spins the compressor wheel, and the process forces compressed air into the engine. Converting the waste energy from the exhaust gas into compressed air for the engine’s intake creates its own problem, however. Compressing the air causes it to heat up, and remember that when a gas heats up, it contains less oxygen. This means less energy is going to the engine, which counteracts the benefit of the turbocharger. This is why the system also includes some type of air cooler (either an intercooler or an after cooler, depending on the configuration). This heat exchanger is designed to reduce the temperature of the compressed air before it enters the cylinders. In most cases this exchange of heat uses circulating seawater to cool the air (see PassageMaker, April 2017). 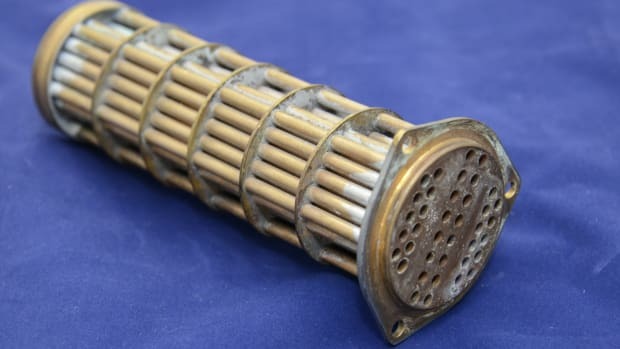 To recap, exhaust gas that is 800 degrees Fahrenheit spins a turbine at something like 100,000 rpm, relying on a system of bearings and seals to minimize friction via lubricating oil while an air cooler using seawater reduces the temperature of the hot compressed air before it enters the engine. What could go wrong? Plenty. 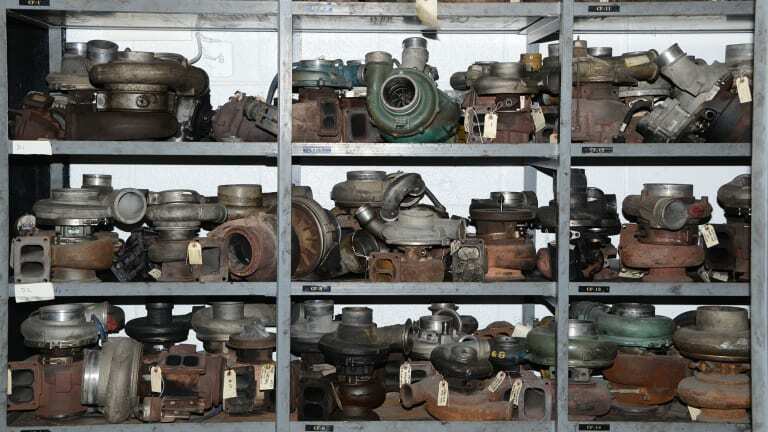 According to BorgWarner Turbo Systems, an analysis of turbochargers removed from service revealed that 40% of failures could be traced to poor lubrication. The turbo depends on lube oil circulating from the engine to minimize friction and to cool the bearings. Due to the exceptionally high speeds at which the turbine operates, even a momentary interruption of oil flow can trash the bearings. So keeping up with the engine lubrication requirements is key to prolonging the life of your turbo. 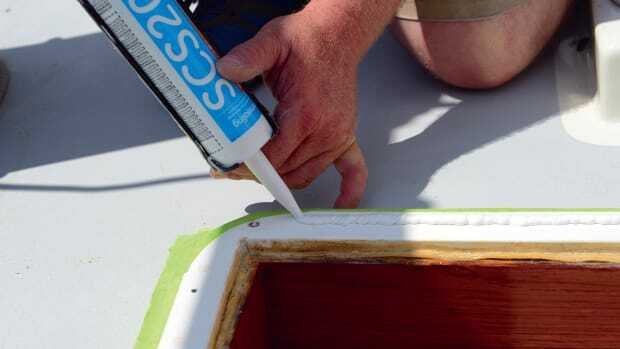 On older boats with unknown service histories, it can be helpful to remove, clean, and inspect the small oil lines leading to the turbo. Lubrication can also be an issue at startup or shutdown. 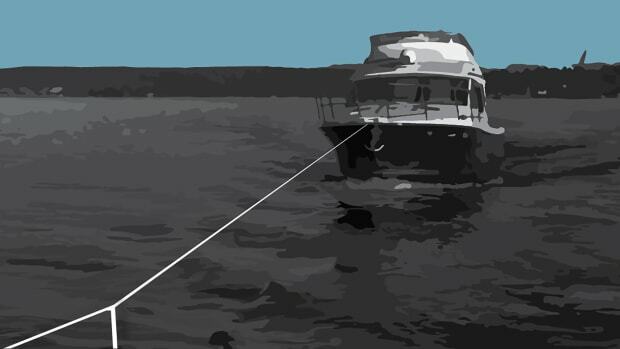 Fortunately, on cruising boats our engines have time to warm up as we untie lines and get underway. Starting the engine gets oil flowing to the turbo, but flow alone does not suffice—the oil must be warmed to idle temperatures before loading up the turbo. Proper engine shutdown procedures also must be followed. 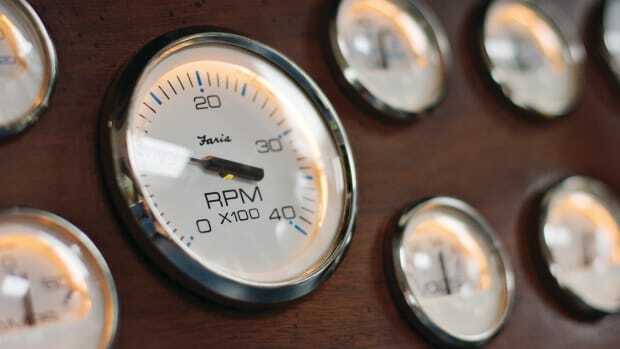 The old practice of gunning the engine in neutral and shutting it down should never be done. The turbo will continue to spin and wind down, but with the engine off, the oil flow stops, resulting in premature wear. Instead, the engine should be allowed to cool down at idle for about five minutes before you hit the stop button. 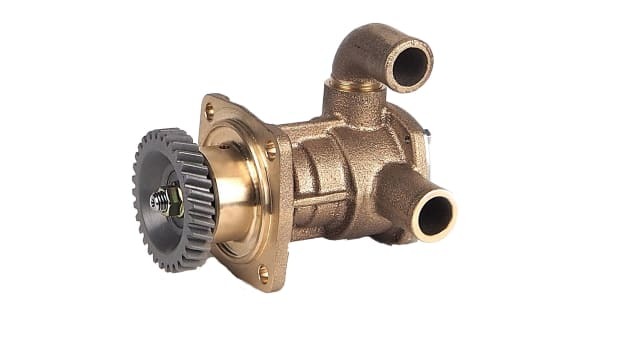 This allows the cooling system to dissipate heat from the turbo before the oil flow stops. Without time to cool down, the hot turbo will bake any residual oil, creating a buildup of harmful deposits. A similar problem can occur at startup on engines that have been sitting for a few months without starting. In these situations, the oil will have drained out and any residue will have lost its lubricity. Starting the engine will cause the turbo to spin before fresh lubricating oil reaches the bearings, creating unnecessary wear. While one instance would not be a problem, bearing life would be significantly reduced if this were a recurring issue. On some engines you can avoid this wear by briefly cranking the engine while engaging the stop switch. The cranking will force fresh oil into the turbo while the stop switch will prevent it from starting and spinning the turbo. 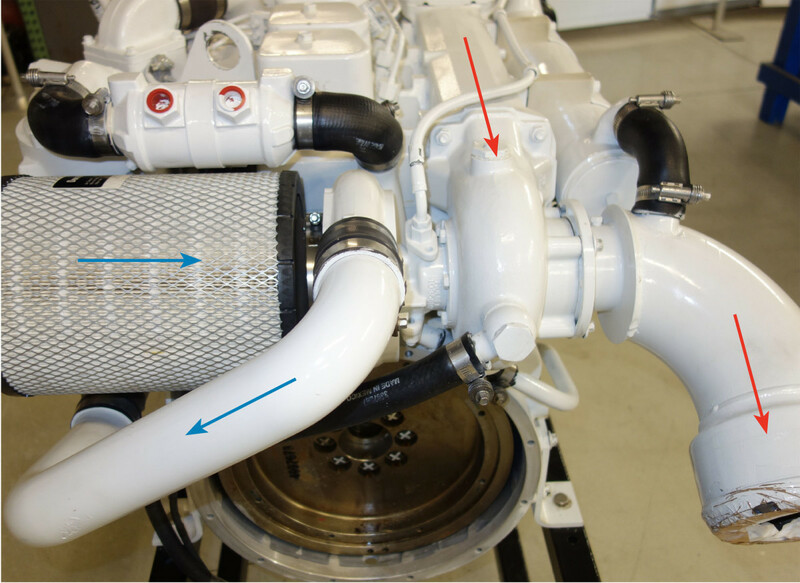 On this turbocharger, exhaust gas enters at the red area at the top and exits on the lower right at the mixer elbow. The air filter on the left allows fresh air into the compressor. The pipe running under the air filter directs the compressed air into the engine’s intake manifold. Again, according to the BorgWarner analysis, another 40% of the failures were caused by foreign material entering the turbine or the compressor. What’s foreign material? Anything other than clean air. 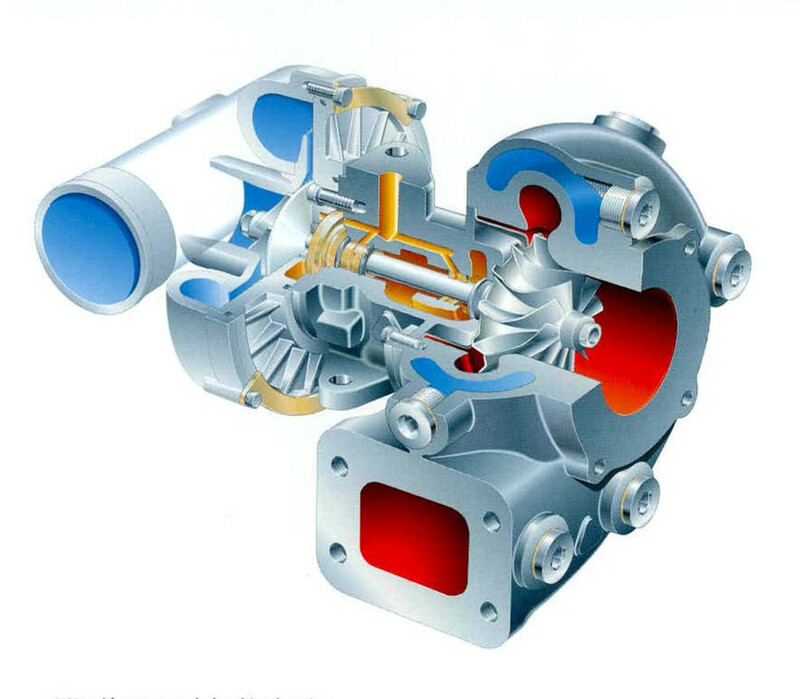 Air enters the turbocharger from two different sources: exhaust gas through the turbine and ambient engine room air through the compressor wheel. The air filter, well maintained, will protect the air intake side, and for this reason damage to the compressor wheel happens far less often. Any metal that enters the exhaust system (very small pieces from a failing valve or a scuffed piston, for example) will cause serious damage to the thin, precise vanes on the turbine. Bits of improperly fitted or improperly attached gaskets or hoses can do the same. Given the velocity of rotation and the relatively fragile nature of the components, it doesn’t take much to cause damage that can put your turbo out of commission. 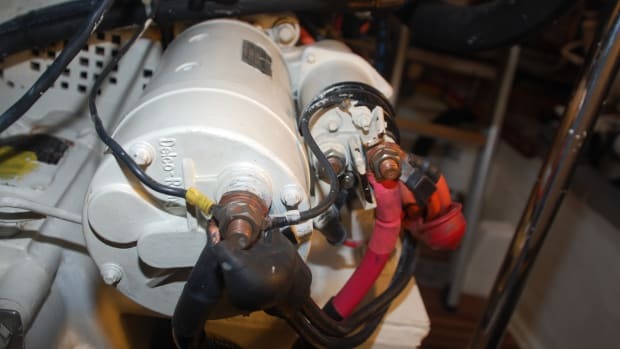 Marine turbochargers face an issue rarely seen in automotive and industrial applications: continual exposure to salt. 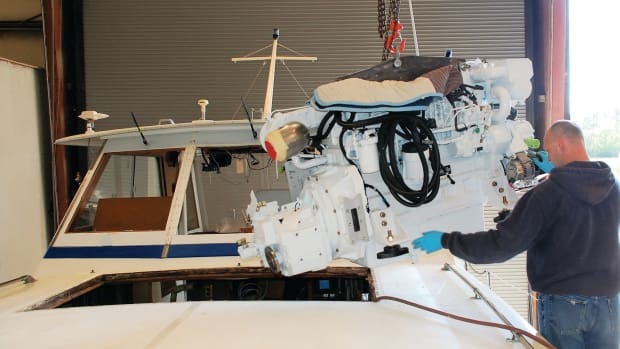 The seawater injection into the exhaust riser produces a mist while operating, and when sitting at the dock the exhaust system continues to expose the turbo to salt air. Over time, regardless of engine hours, this exposure eats away at the turbocharger’s housing. Pitting gradually increases the clearance between the turbine fins and the housing, resulting in a loss of boost pressure. 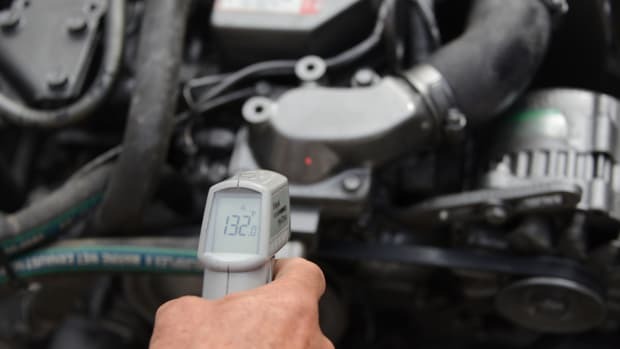 When this condition develops you will experience reduced engine performance and excessive exhaust smoke. While manufacturers engineer their turbochargers to operate at high temperatures, the units still have design limits. A restriction in the air supply into the engine, such as a fouled filter, will drive up the engine and exhaust gas temperatures. Excess heat can cause cracks in the housing or failure of the turbine. Chronically running your engine at low rpm for long periods can cause a variety of engine problems as well, including buildup of carbon on the turbine fins and inside the housing. Because the turbine blades must pass within thousandths of an inch of the housing so the compressed air cannot escape, the turbine and compressor wheels must be finely tuned and balanced when installed. Any buildup on the blades can throw the wheel off balance enough to cause vibration and bearing wear, and possibly breakage of the blades. If you are seeing accumulation of soot around your exhaust discharge, you probably have accumulation inside the turbo. You can avoid this situation by periodically (as part of each day’s run) running your engine at loads close to 80% or even higher. A procedure referred to as “turbo washing” uses a water-based solvent to clean the fins and should be performed by a skilled mechanic. Some engine manufacturers specify a service interval based on engine hours for this procedure. Guessing at expected turbocharger longevity amounts to just that–guessing. In recreational applications, 3,000 to 4,000 hours might be expected. Of course, much higher intervals are achieved as well. Turbos live in an extreme environment and despite your best efforts, at some point your turbo will require a rebuild or replacement. The steps outlined above will extend your turbo’s life and will provide warnings before unexpected failure.